Biblia latina. Nuremberg: Anton Koberger, 30 July 1477. Provenance: Morris. — Richard Bennett. — Sotheby 1898, lot 175 (sold to Ellis for £50). — Henry Yates Thompson (sold in 1924). — Metropolitan Museum of Art, New York (accession number 24.142.2) [acquired 1924; on view in the Museum’s Gallery 305]. References: Breck, Joseph. 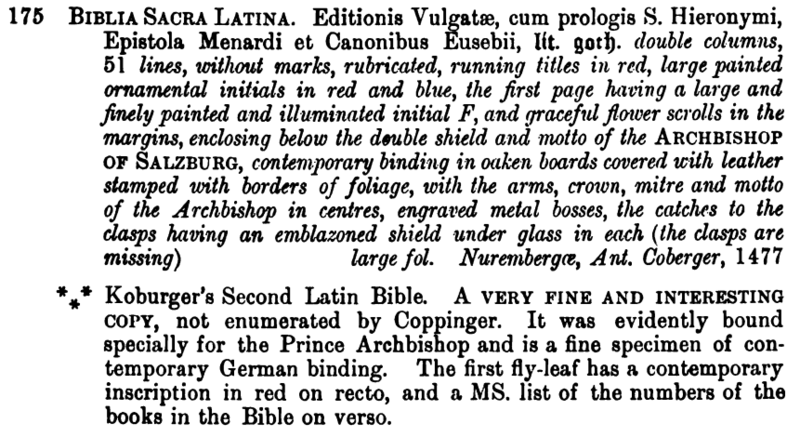 “Bookbindings and Other Leather-Work.” Metropolitan Museum of Art Bulletin 19 (December 1924): 299–300. — Ellis valuation, fol. 21 (£50). — ISTC (ib00552000).